Walter Ball's Rural Route appeared in the Toronto Star Weekly from 1956 until 1968 when the Star Weekly ceased publishing. Walter Ball was born in Cookstown, Ontario in 1911 and began his career on the Toronto Star in 1932. * This sample is from October 4, 1958. 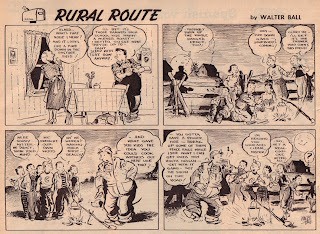 Comic historian and archivist Bill Blackbeard mentioned that Rural Route appeared in a few newspapers in the Midwestern United States. A 1982 interview with the cartoonist appeared on the CBC and can be heard HERE.